TCP Training News has the latest Information on our Short Courses, Online Courses & Industry News. 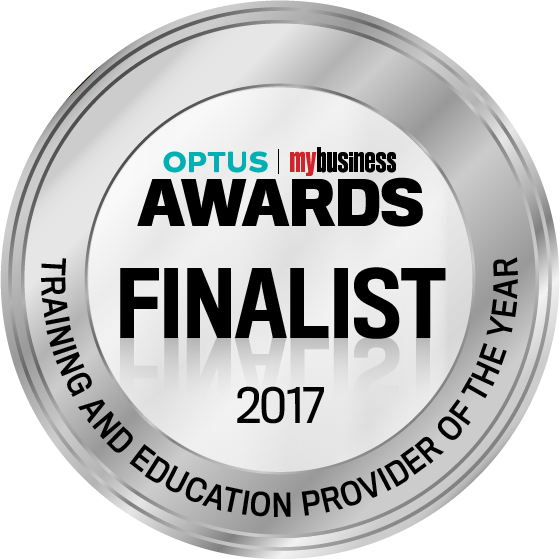 TCP Training has been announced as a finalist for the Optus My Business Awards 2017. The Sydney hospitality sector is constantly evolving and we like the latest trend; so far in 2017 we have seen smaller venues for up to 100 guests popping up everywhere and anywhere. 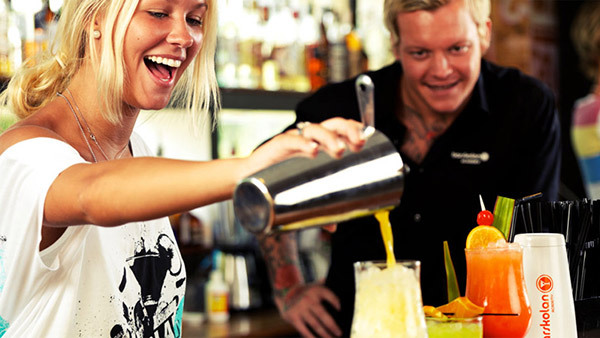 It is mandatory in Australia to undergo Responsible Service of Alcohol (RSA) training and get certified if you will be working in any licensed establishment that offers, serves, sells or supplies alcohol (e.g. pub, restaurant, nightclub). You are not allowed to work in the liquor industry without having undergone and successfully completed your RSA training. You can do an RSA course online, via correspondence or in a classroom. Which option is right for you depends on the state you will be working in and your preference for learning. What will RSA training teach you? After completing the RSA course, you will understand legal responsibilities associated with the service of alcohol and will be ready and able to serve and sell liquor in licensed premises. What type of jobs do you need your RSA certification for? What are the RSA requirements per Australian State? Every Australian state / territory has its own liquor licensing body and in some cases its own RSA accreditation. The image for this blog provides a handy overview of the options available for your RSA certification around Australia. 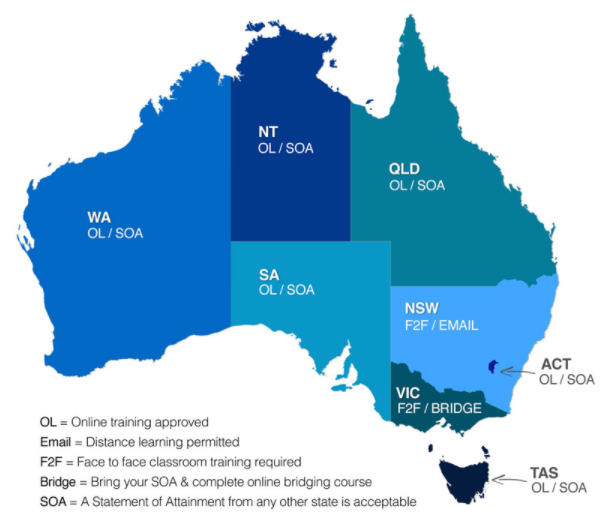 As you can see Queensland, Western Australia, South Australia, ACT, Tasmania and Northern Territory accept online delivery of the National RSA course. Victoria does not currently recognise online as a valid medium for this type of training. Students can do a simple bridging course to obtain RSA certification for this state if they bring their Statement of Attainment (SOA) from any other state. In Sydney and the rest of New South Wales, it is possible to do you RSA via email correspondence. RSA correspondence is a great solution for students who cannot get to a training venue and/or find a suited time in the course schedule. Students in this situation can use an online learning system, download necessary RSA documents, record videos, study remotely and complete compulsory assessment activities. Once all is completed, students submit their work for an inspector to go over and mark. Another way of gaining your NSW RSA certification is face-to-face, through a classroom course. Once the course is successfully completed, students will receive a Statement of Attainment for SITHFAB002 Provide responsible service of alcohol. This Unit of Competency is Nationally Recognised Training. Where can you get RSA certified? You can do your RSA course with an approved Registered Training Organisation (RTO). TCP Training is a well-established RTO and has training centres conveniently located in Sydney CBD, Dee Why (Sydney Northern Beaches) and Granville (Sydney West) so if you are looking to do your RSA online course, RSA correspondence course or classroom RSA course in Sydney, book with TCP Training today! Have you ever considered becoming a forklift driver? There is lots of demand for forklift drivers in factories and warehouses across Sydney and the rest of NSW. The following article prepares you for the duties you can expect as a forklift driver and gives you an insight in what employers are looking for in a candidate. after packing and sending orders, you will have to enter delivery slips and invoices into a computer. You may have to fill out paperwork and keep the warehouse and surroundings clean and tidy. You’ll use RF scanners for your inventory management. Palettes of items shipped together are labelled with a barcode, sometimes on each individual item. Locations within the warehouse are also identified with a barcode, down to the shelf and even down to an individual rack. When goods are received and being stored, you will use your RF scanner to scan the barcode. This will show you where in the warehouse to place the items. When the goods are placed in the nominated area, scan the product and location again so the warehouse management system will be updated. This way you’ll keep track of which items and where and how many items there are at any given point in time. In some occasions you will be working as part of a team, which means you will need to be approachable and helpful to others. When you work by yourself, you will need to be able to manage your own time and workload, plus you must keep yourself motivated. What are employers looking for in a candidate? Employers look for trustworthy people they can rely on. Some shipments come with deadlines that must be met, or else the company could lose lots of money. For an employer, it’s very important that the job gets done within the given time frame. Attention to detail is also very important, as you could be working with fragile goods that should not get damaged. Basic computer skills are a great advantage when applying for forklift jobs but most of the time you will receive training when starting your new job. Being physically fit will be beneficial to you as at times, there will be some heaving lifting involved. Most employers advertise they need people who can manually lift at least 20 to 25kg. Lots of hiring managers highly rate one’s willingness to learn, so if you have an approachable attitude and are open to learning new skills, you’re one step ahead of the other applicants. 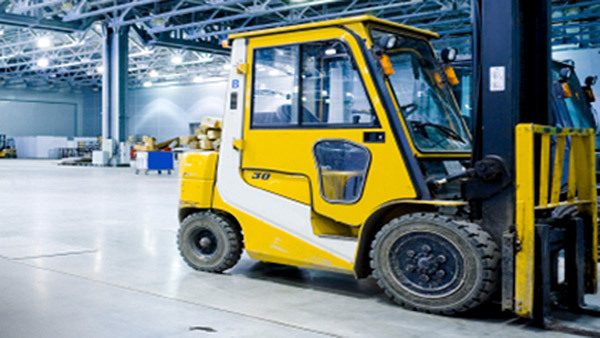 Now most employers look for candidates with forklift experience. If you don’t have this, don’t let this put you off applying for the position. In your covering letter, explain you’re a quick and motivated learner who picks up skills quickly. Make sure to write how amazing you are at all the other requirements for the job. Lastly, you will need a forklift licence for any forklift job in Sydney and NSW. Becoming a licenced forklift driver is very achievable, you can have your licensing done in a matter of days. Simply follow this link to book your forklift training course today! Aussies love their coffee! They love their coffee so much they are happy to pay $4,50 and wait 10 minutes for a cheeky take-away. 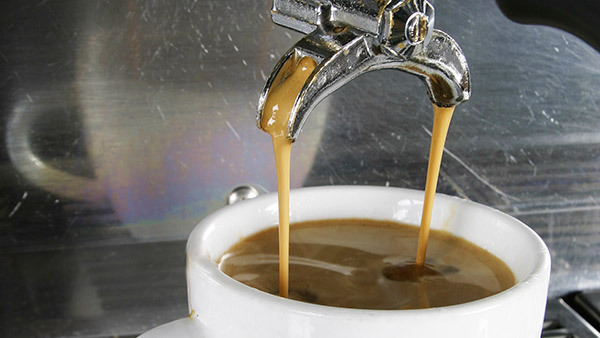 They love their coffee so much, American coffee company Starbucks never stood a chance. With great enthusiasm, they opened 84 stores countrywide in 2000, only to close 61 of them 8 years later. And why? They could not live up to the high-quality coffee standards Australians holds so dear. ​Anyone for a Summer Job?